Drunken Botanist Tour Dates: Southwest, East Coast, and Where is the Gin? Yes, I am still on the road! It’s hard to believe, I know. I can hardly believe it myself. So here are some tour dates, and the complete list, if you’d like to see it, is here. As always, check details with the venue before heading out. This is a private event for Director’s Circle Members only. This event will be at ArtBar, 119 Gold Ave SW. Albuquerque, where we will drink some fabulous cocktails. Bookworks is sponsoring the event. A special Museum of Science event held at Grand Ten Distilling. Talk, tour, and tasting included in ticket price, and fabulous food available for purchase from The Dining Car food truck. Advance ticket purchase required. The Drunken Botanist at Warburg Lounge. Ticket purchase required. Special cocktail event with The Crunkleton and Fearrington Inn. And I have one last plant collection for you. I think I’ve saved the best for last, because really, what spirit goes best with just about any herb, fruit, or vegetable than gin? So this is the Old Tom Gin Garden, named after a sweeter style of gin that was popular in the 19th century. But to be honest, we just liked the name. It was incredibly easy to come up with plants to pair with gin. If anything, we had a hard time figuring out what not to include. 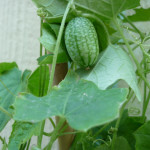 But in the end, we settled on two kinds of cucumber, borage, basil, and lemon thyme. Anyway, those are the plants, all available from Territorial and also through West Coast garden centers supplied by Log House Plants. And your cocktail for the week? How about this? Squeeze lemon into cocktail shaker and combine all ingredients except the club soda. 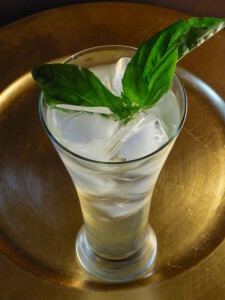 Muddle cucumber and basil, then add ice, shake, and strain into a tall, skinny Collins glass filled with ice. Top with club soda and add garnish. I really enjoyed you on Radio Times this morning. I called in but it was too close to the end of the program. I was calling as a follow-up to the gentleman from Delaware wondering about making a holly based alcoholic beverage. My comment related to mate from Yerbe Mate which is a variety of holly – llex paraguariensis, I too am wondering now if there is an alcoholic version of that drink. Best of luck on the rest of your book tour and I look forward to reading your books.